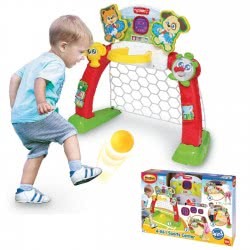 Get your little peanut moving with air-powered, unpredictable ball-popping action! 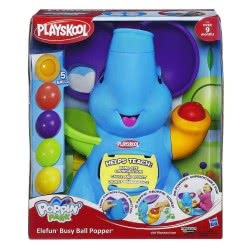 The award-winning Playskool Elefun Busy Ball Popper toy provides babies and toddlers opportunity for the active playtime they need to help their muscles and minds grow. 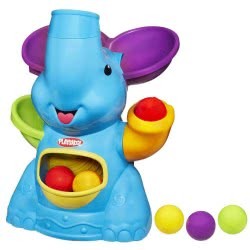 Once the balls pop out of the elephant's trunk, it's anybody's guess which way they'll go, and 4 modes of play keep the surprises popping over and over again! 4 Play Modes: Turn His Trunk to Control the Fun: Whether you've got a baby on his bottom or a toddler on her toes, this elephant toy has 4 unique play modes to keep the fun popping. Simply turn his trunk to control the fun! Each mode keeps your little one busy no matter what stage they are at; sitting up, standing, crawling, or walking. 1. Put 'n Take Play Turn the trunk toward the elephant's green arm to make the ball drop into his belly. This is a great mode for little ones who are just learning to sit up. 2. Continuous Cycling Turn the trunk toward the elephant's orange arm to make the balls cycle back through the popper on their own. This mode can be fun for kids who are just at the sitting or standing stages. 3. Chase-Me Play Point the trunk forward to send all of the balls flying all over the room and encourage your child to get up and grab them! Turn to this mode to help encourage crawling or walking. 4. Random For even more surprises, turn the trunk to the center for an unpredictable combination of the other 3 modes! Playskool and all related properties are trademarks of Hasbro. Help Baby Hit Those Milestones: From their fingers to their feet, this toy for toddlers was designed to encourage learning through active play. 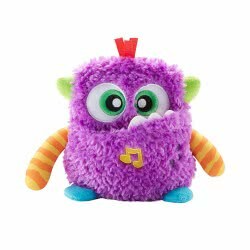 Check out how this toy can help promote your child's development! Gross Motor Skills: Whether they're just learning to sit up, crawl, stand up, or even walk, the ball-poppin' action helps stimulate their movements. Cause and Effect: The action of pressing the activation button or putting the balls in the toy to make the balls pop out again can help kids begin to understand that the things they do can affect their surroundings. Fine Motor Skills and Hand-Eye Coordination: Grasping and releasing the balls helps fine-tune those finger muscles, and aiming to place them in the elephant's ear helps with their hand-eye coordination. These are some basic skills needed to write and type! 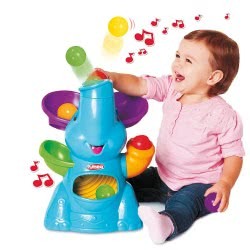 Keep Little Ones Energized, Entertained, and Engaged: With 4 unique play modes, 10 fun tunes, and easy activation, kids will love experiencing the Elefun Busy Ball Popper toy again and again. It is a great birthday or holiday gift for your favorite toddler, and all of the unpredictable poppin' action is sure to entertain the whole family! Elefun base unit, ear attachment, stabilizer, and 4 balls. © 2014 Hasbro. All Rights Reserved. Get little ones up and moving with unpredictable ball-poppin' fun 4 modes of play to keep kids going and growing Helps kids develop gross and fine motor skills, hand-eye coordination, and cause and effect Easy push-button activation with 10 fun tunes 2012 Infant and Toddler Toy of the Year Award winner Ages over 9 months 4x 1.5V D alkaline batteries required. Batteries not included. Adult assembly required. No tools needed.